Everyone who has learned English either as a child or as an adult will agree that phrasal verbs are the most difficult part of English grammar. How could one forget the long lists of verbs they had to memorize in school? Once the day of the exam had passed, everything learned was immediately forgotten, except a few exceptions. 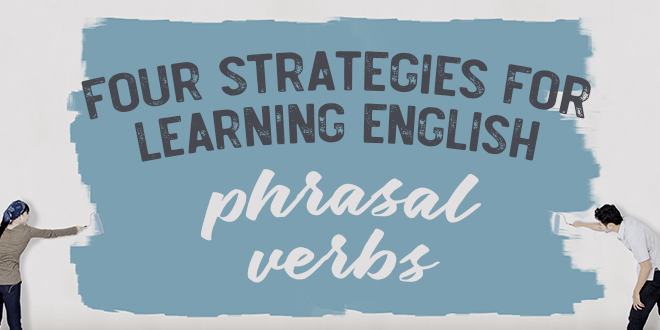 Phrasal Verbs in English: @ABAEnglish gives you a few tips to finally learn them. Why is it so difficult to memorize and use phrasal verbs? ABA English is here to explain the reason and to offer you some useful techniques to learn these sadly famous verbs so that you will never forget them. Why is Learning Phrasal Verbs So Difficult? Some phrasal verbs are transitive and allow an object, while others are intransitive and do not allow an object. Other verbs can be used both transitively and intransitively. In some cases, the verb and the particle are inseparable, while in others the object comes between the verb and the particle. At other times, the object can be found both between the verb and the particle or after them. In short, you have just learned one reason why phrasal verbs are so difficult to learn: they are not all equal. Let’s look at some examples. The teacher told her off for talking during the lesson. I am not sure of the date of the appointment, I will check it out. To memorize the phrasal verbs, you can create a table of the most frequently used verbs. Start with verbs like bring, call, come, do, fall, get, go, keep, look, make, run, and turn. After finishing with the most used verbs, you can add more verbs to your table every day. Some grammar books have an annex with phrasal verbs, examples, and their translations. Try to create sentences that will serve as an example for each new phrasal verb you learn – this is the best way to memorize them! Write a topic or a situation in the center of a notebook page, for example, “at work.” Then, select some phrasal verbs that are related to the topic you have chosen. Finally, write the translation next to the verb as well as its characteristics: Is it transitive or intransitive? Are the particle and the verb separable or inseparable? Write an English verb in the center of the page, joining it to the particles that can accompany it, adding examples and translations. Pay attention to the lyrics of songs. When you find a phrasal verb, write it in your notebook next to the sentence in which it is used in the song, the translation, and some other example sentences. Finally, don’t forget to sing the songs you have learned out loud! Another effective way to learn phrasal verbs is to visualize the action described by the verb. For example, the verb get up means ‘get out of bed’ or ‘wake someone up.’ So, imagine the scene, making it a little funny if you can. This image will remain engraved in your mind and the verb along with it. If you imagine yourself taking a megaphone and shouting “Get up!“ at your boss who is napping in an armchair, you will definitely remember the verb and its meaning. But, make sure things like this happen only in your imagination! Always choose situations from your daily life because they will help you remember the verbs better. Finally, let’s face it, the most important thing you can do to memorize these verbs is to use them in everyday situations and to use them a lot. Whether you are abroad or sitting comfortably on your couch, try to use them as much as possible. If this is not enough, you can try the ABA English course. We have many exercises to offer, as well as 144 video classes and short films to help you improve your English. Let’s start! I want to download the app!